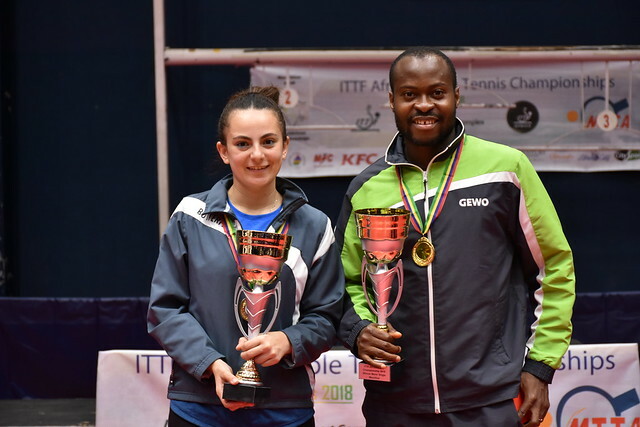 The defending champion, beating Egypt’s Dina Meshref in the final in 2016 in Agadir, it is a determined Nigerian in the guise Olufunke Oshonaike, who prepares for the forthcoming 2018 ITTF African Championships to be staged in Port Louis, Mauritius. Play commences on Monday 3rd September and concludes on Friday 9th September. Furthermore, Olufunke Oshonaike, now 43 years old, is not just aiming to retain the title; she is aiming to win for the fourth time. Previously she emerged successful in 1992 in Lagos and in 2002 in Bizerte. Certainly Olufunke Oshonaike, who reached the second round of the Women’s Singles event just under one month ago at the 2018 ITTF Challenge Seamaster Nigeria Open, losing to China’s Fan Siqi, is confident that Nigeria can wrestle the Women’s Team title away from Egypt. “We are all in good form for this competition because it is obvious that it is a fight between Nigeria and Egypt. We have not attended the World Team Cup in recent times; we would like to make it there this time around; that is why we want to target the team event as well. However, to be sincere my target is the singles event, I am in fine shape and hope that I can repeat the feat I achieved in Morocco again.” Olufunke Oshonaike. Ready for the action to begin and whilst youth may not be on the side of Olufunke Oshonaike, there is plenty of experience, more than all others competing in Mauritius.